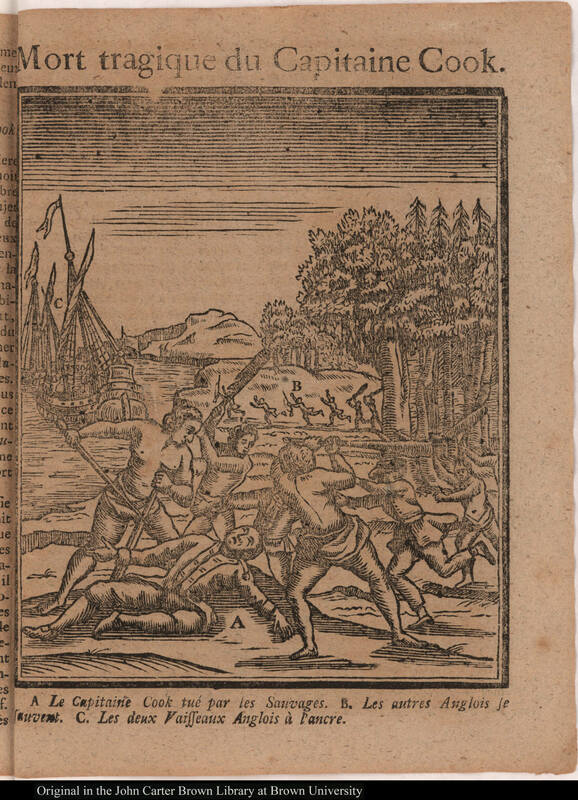 Mort tragique du Capitaine Cook, Antoine Souci, 1780, John Carter Brown Library Archive of Early American Images. The Death of Captain Cook is a popular subject for art. This woodcut, from the 1780 Almanach historique nommé Le messager boiteux, is not a masterpiece among those. The ships are anachronistically old, and the Hawaiians are portrayed in an odd fashion that looks more like classical Hercules than the contemporary Kalaniʻōpuʻu. What makes this an interesting piece is that is represents a continental European perspective on the event. For my purposes, that means the sailors here may represent what continental Europeans thought British sailors should look like. 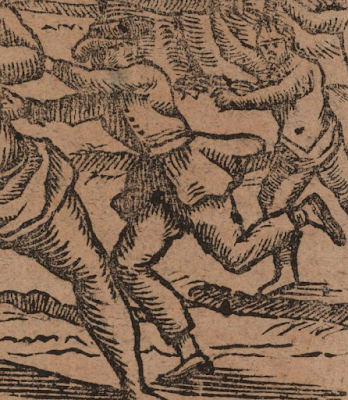 The only sailor we get a good look at is fleeing from a Hawaiian raising his club. Our frightened sailor wears a single breasted jacket with flowing skirts that end at the top of the thigh. His trousers are close fit, and end about the bottom of the calf. He also wears a cocked hat with the point forward.